What is a sunburn? Which radiation waves from the sun cause skin damage? Can sunburns cause skin cancer or other skin problems? How can you tell if you have a mild or moderate sunburn (symptoms)? How can you tell if you have a severe sunburn or sun poisoning (symptoms)? What causes the skin to tan? What natural home remedies provide sunburn relief fast? What medications are used for the treatment of a sunburn? What type of skin type is most susceptible to sunburn? What strengths of sunscreens work best? UV radiation damages the skin the eyes. Several days after sun exposure the skin may, swell, blister, peel, and itch. using OTC pain relievers for pain and inflammation, for example, acetaminophen (Tylenol) and nonsteroidal anti-inflammatory drugs (NSAIDs) like ibuprofen (Advil) and aspirin. Sunburn may cause permanent skin damage and skin cancer (malignant melanoma, basal cell carcinoma, squamous cell carcinoma). People with certain pigment disorders like albinism, lupus, porphyrias, vitiligo, and xeroderma pigmentosum, and those with fair skin are at most risk of sunburn. Some medications may increase sensitivity to sunburn (photosensitivity). Heat stroke is a severe form of high body temperature (hyperthermia) that is life threatening (the person may die). The best way to prevent sunburn is to avoid long exposure to sunlight. Sunscreen and sun-protective clothing are important measures to limit sun damage. Apply sunscreen before going outdoors, apply it liberally, and re-apply frequently. Sunburn is an inflammation of the skin caused by overexposure to ultraviolet (UV) radiation from the sun and tanning beds. A similar type of skin burn can follow overexposure to a tanning bed. UV radiation can also damage the eyes, although no surface burn is apparent. Sunburn is very common. According to the CDC, in the United States, approximately 50% of adults age 18 to 29 report having at least one sunburn in the preceding year. What is ultraviolet radiation (UV)? What time of the day are they most intense? UV light is radiation energy in the form of invisible light waves. The sun and tanning beds give off UV light. UVB rays usually affects the outer layer of the skin, and are more likely to damage the skin and cause skin cancer (melanoma, basal and squamous cell carcinoma). UVA rays are much less intense than UVB rays, but are about 50 times more likely to reach the deeper layers the skin and cause damage than do UVB rays. Tanning beds also produce UVA and/or UVB. These artificial rays affect the skin in the same way as do UVA and UVB from the sun. When and where is the sun's radiation waves most intense? UV rays are most intense at noon and the hours immediately before and after (between 10 a.m. and 4 p.m.), particularly in the late spring, summer, and early autumn. Although they are less concentrated at other times of the day and year, UV rays can still damage the skin and eyes - even in the dead of winter and on cloudy or rainy days. UV rays also increase in intensity in relation to altitude and latitude. The higher the altitude, the greater the concentration of UV rays. Likewise, UV rays are more powerful nearer to the equator. UV rays "bounce" off reflective surfaces - including water, sand, and snow. Thus, a skier, swimmer, angler, or beachcomber may be bombarded with UV rays from above and below. Following are pictures of various degrees of sunburn. Malignant melanoma is the most dangerous form of skin cancer that can cause death. Basal cell and squamous cell carcinomas are slow growing and are far less likely to spread to other parts of the body than melanoma. Both basal and squamous cell cancers can be cured in most cases if diagnosed early. Basal and squamous cell carcinomas are very common, and if diagnosed properly and promptly, are curable. It is very important to have routine skin checks by a skin doctor (dermatologist) annually. Annual screening can help in early diagnosis of skin cancer or pre-cancerous conditions that may lead to skin cancer. What complications from other diseases or health problems can occur from sun exposure? Repeated overexposure to ultraviolet rays can also scar, freckle, dry out, and wrinkle the skin prematurely; moreover, frequent overexposure to ultraviolet rays can increase the risk of developing eye cataracts and macular degeneration, a leading cause of blindness. People with certain diseases and health problems can increase the skin's sensitive to the sun's UV radiation, or example, in people with lupus, the sun's rays can cause flare-ups, including a worsening rash. Other health problems that are more prone to the sun's UV radiation include albinism, porphyrias, vitiligo,and an inherited hypersensitivity to the cancer-causing effects of ultraviolet light (xeroderma pigmentosum). The skin becomes red, tender, and hot. Touching or rubbing the skin causes pain. Because heat triggers fluid loss, a sunburn victim can also become dehydrated. For several days after exposure, the skin may itch, swell, blister, and peel. Some sufferers develop welts or rashes. Skin peeling can occur several days later after a sun rash develops and is a sign of healing and rebuilding of skin. More subtle exposures to the sun may not have any obvious immediate symptoms such as the ones listed above. Most sunburns are mild causing only skin redness, pain, and irritation or possibly a rash due to involvement of the outer layer of skin (first-degree burn). This type of burn may be painful to touch. A more moderate sunburn (second-degree burn) may cause the skin to become swollen (edema), and very red, with painful blisters. This type of sun rash may take longer to heal. People who have chronic (long standing) exposure to sun can increase their chances of developing chronic skin damage from sun exposure (wrinkles, aging, age spots, freckles, skin cancer, scarring, etc.). The skin type of the person affected. The time, duration, location, and altitude of exposure. Medications the person has been taking (sun-sensitizing drugs may increase a person's susceptibility to a bad sunburn). Skin preparations (sunscreen) the person has been using. A severe sunburn also may be associated with heat exhaustion or heat stroke, which is a medical emergency. Severe cases of sunburn require emergency medical treatment. A follow-up visit with a physician is not necessary unless the sunburn was severe. If you have had a significant sunburn talk to your doctor so that he or she can do a skin body exam to look closely for symptoms of skin cancer and other problems caused by a severe sunburn. The skin contains a pigment called melanin. It colors the skin, imparting a wide variety of skin tones. Melanin blocks some of the UV rays from penetrating the skin. After repeated or prolonged exposure to UV rays, the skin produces more melanin. Consequently, the skin darkens, or tans, which in turn protects the skin to a certain degree. If you have symptoms of a severe sunburn call your doctor, or go to an urgent care facility, or emergency department. If you apply compresses the burned skin, dip them in cool or slightly cold water. Do not use cold water. Sunburn symptoms are mild or moderate, drink plenty of water to replenish the fluids to avoid dehydration, and use natural or home methods to relieve pain, itching, blisters, peeling, and inflamed skin. Home remedies can provide sunburn relief and help treat blisters, rashes, burning, inflammation, and itching. Soak in a bathtub of tepid, plain, soap-free water (soap can irritate the burn). Some preparations, especially those that contain benzocaine (Endocaine, Hurricaine), can trigger an allergic reaction in some people, and certain ointments can slow healing by sealing off the skin from the air. Headache may be caused by dehydration. Drink plenty of fluids (no caffeine or alcohol) to prevent dehydration while out in the sun for prolonged periods. Moisturize with creams or aloe Vera gel may also provide symptom relief. Can antioxidants protect against a sunburn? Antioxidants are agents that can prevent certain harmful reactions in the body. One of these agents are free radicals, which is the formation of some potentially harmful molecules in the body. Antioxidants are natural agents that may prevent or reduce the formation of free radicals. Some sun damage is a result of this reaction. Oral or topical antioxidants (vitamins A, C, and E, and green tea) may theoretically protect the skin against sunburn. Clinical data is not sufficient to support their use instead of or in addition to, traditional sunscreen. If blisters form after sunburn, do not attempt to burst or "pop" them unless they are located in a very painful area, or are otherwise causing a lot of discomfort due to size. Most blisters will break by themselves if they are left alone. Blisters are better left uncovered as rubbing or placing a tight cover over them may cause infections and more discomfort. If blisters need to be covered because they cause discomfort by rubbing on clothes, use a loosely applied dressing. Once a sunburn blister breaks, the area of the broken blister should be kept clean by washing it frequently with soap and water. The left over skin should be left alone, but cleaned, until it falls off. Broken blisters generally heal on their own, but topical antibiotic ointments should be applied to the area of broken blisters to prevent infections. If a sun blister is uncomfortable or too large or located in a cosmetically unappealing area, consider breaking it carefully. This could be done by gently cleaning the area well with soap and water or rubbing alcohol and using a sterilized needle to punch a hole at the edge of the blister gently. The fluid inside can be pushed towards the hole and drained. The area should be cleaned again and covered with a loose dressing afterwards. Topical antibiotics can be applied to the broken blister to reduce the risk of infection. Most of the medical treatments for a sunburn are only used to treat symptoms like pain, inflammation, itching, burning, blistering, and peeling. Redness, pain, and discomfort: Nonsteroidal anti-inflammatory drugs (NSAIDs) in oral (ibuprofen, Motrin, Naprosyn, Advil etc.) or topical diclofenac 0.1% gel (Solaraze) forms have shown to reduce redness if applied before or immediately after UVB exposure. This benefit may be diminished after 24 hours. These medications may also help relieve the symptoms of sunburn such as pain and discomfort. Itching: Topical over-the-counter (OTC) moisturizer creams, especially if you apply it right after a shower or bath, can help relieve itching. Topical anesthetics like benzocaine may help relieve other painful symptoms. These medications also relieve headaches or body aches associated with a sunburn. If you are pregnant and get a moderate to severe sunburn, contact your doctor to discuss what treatments are safe. People with certain pigment disorders (such as albinism) and those with fair skin are at the highest risk of suffering a mild to severe sunburn. The American Academy of Dermatology classifies skin types into six categories (in terms of susceptibility to sunburn) for skin colors ranging from fair to black. This is called the Fitzpatrick classification. People with Skin Type 1 have very fair skin (pale or milky white), blonde or red hair, and possibly freckles. These people can suffer a burn in less than one-half hour when exposed to summer sunlight at midday. People with Skin Type 1 never tan. People with Skin Type 2 have very light brown skin and possibly freckles. They burn in a short time in the sun, although they can achieve a very light tan. People with Skin Type 3 (called "average Caucasians" by The American Academy of Dermatology) have skin that is slightly more brown than the skin of a Type 2. They can develop a moderate sunburn and a light brown tan. People with Skin Type 4 have olive-colored skin. Ordinarily, they develop only a minor sunburn while acquiring moderate tan. People with Skin Type 5 have brown skin and can develop a dark tan, rarely burning. People with Skin Type 6 have black skin and never burn. It is often difficult to accurately determine an individual's skin type simply by looking at the color of the skin. It is best to ask the person how quickly they may burn and how easily they tan. The response can determine the person's skin type. Sunscreens protect the skin by absorbing or reflecting the UV radiation, and may be classified into two groups, physical sunscreens, and chemical sunscreens. Many available sunscreens mainly protect against UVB radiation rays, and may not adequately protect against long standing UVA radiation exposure. The most recommended practice for adequate protection from UV radiation exposure is a combination of physical and chemical sunscreens. SPF, or Sun Protection Factor, is the measurement of how well an agent may protect against sunburn. SPF can be calculated from the amount of time it takes to develop mild redness or burning in an unprotected person. For example, if someone develops mild sunburn-related redness in 20 minutes, he or she may develop the same degree of redness in 300 minutes (5 hours) with an SPF 15 sunscreen (15 multiplied by 20 minutes) when properly applied. Sunscreen products that are not "broad spectrum" with SPF values from 2 to 14 will be labeled with a warning that reads, "Skin Cancer/Skin Aging Alert." Water resistant sunscreen claims must have information about how much time a person can expect to have the declared SPF level of protection while sweating or swimming. Two times will be permitted on the labels: 40 or 80 minutes. Manufactures can no longer make claims that sunscreens are "waterproof" or "sweat proof" or identify their products as "sunblocks." Sunscreens cannot claim protection immediately on application (for example, "instant protection") or protection for more than two hours without reapplication. SPF 15 sunscreen is the minimum requirement for most people. Stronger sunscreens or sunblocks are recommended for people who easily burn in the sun, and have spent longer amounts of time in the sun. Apply sunscreen 15 to 30 minutes before you go out in the sun, and reapply it every 1 to 2 hours. Some doctors encourage more frequent reapplication, especially shortly after being exposed to the sun. Apply sunscreen liberally; spreading the product too thin may not achieve the desired degree of protection. A general recommendation is to apply an amount similar to the size of a golf ball for a person of average build. Exposure to water may wash off sunscreen, so reapply it after you your body is dry. Sunscreen sprays are available, and generally are effective; however, there is a concern about the amount of spray that actually sticks to the skin after it is applied. The spray can be dispersed by wind, an insufficient amount may be sprayed, or the sunscreen may be sprayed too far from the body. It is recommended that sunscreen sprays be used in conjunction with other more traditional topical sunscreens or sunblocks for the best sun protection. Moreover, there are concerns about the amount of sunscreen that may be inhaled unintentionally, and if that poses any health risks. Sunscreens may degrade over time or after long exposure to sun and heat. The bottle should not be kept in the car or under direct sun exposure for a long period. If the expiration date has passed, the product should be discarded. Sunscreens generally expire or lose their effectiveness after about three years. Limit the amount of time of sun exposure and avoiding the peak sunshine hours of late morning to early mid-day, generally 10 a.m. to 4 p.m. and do not spend too much time in the sun, especially in direct sunlight in the middle of the day. Wear protective clothing such as a broad-brimmed hat, UV protected sunglasses and clothing; long pants, and shirts with sleeves that cover the arms (thicker fabrics and dark clothing in general protect better compared with light clothing - there are clothing products available that offer "UV" protection). Be aware sunburn can occur even on a cloudy day (clouds don't stop ultraviolet rays), and even when you are in the water. Remember that sand, water, and snow reflect the sun's rays and increase the chance of burning during beach activities or skiing. Use a protective sunscreen to minimize the penetration of UV rays. Sunscreens with a skin protection factor (SPF) of at least 15 are recommended for everyone, even dark-skinned individuals, exposed to the sun. Light-skinned people should use a higher SPF when in direct sun. Apply several minutes before going into the sun and reapply often. Drink plenty of water or hydrating drinks to avoid dehydration. Do not drink alcoholic drinks because they will dehydrate you more. CDC.gov. 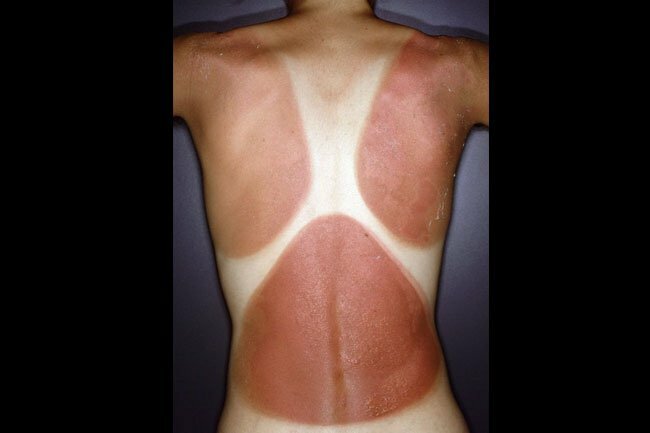 Sunburn and Sun Protective Behaviors Among Adults Aged 18 - 29 Years - United States, 2000 - 2010. NIH; National Cancer Institute. Cancer Stat Facts: Melanoma of the Skin. skincancer.org. FDA Issues New Sunscreen Labeling Rules. Updated: May 11, 2012. Zhang, AY, MD. Drug-Induced Photosensitivity Treatment and Management. Medscape. Updatd: Jun 14, 2017.